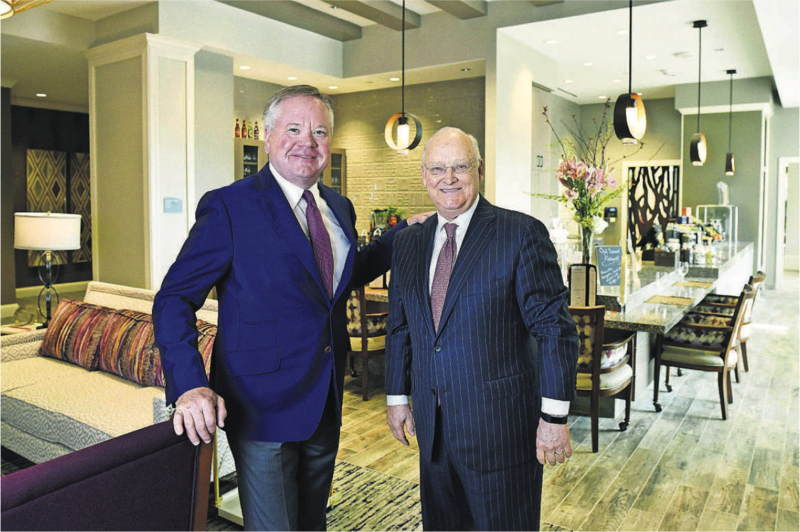 John Goff (left) and Denny Alberts stand near the dining area in their latest project, HarborChase of the Park Cities. The 134 assisted-living and memory-care apartments look a lot like trendy urban rentals in Uptown but are adapted for the needs of the slower set. ‘Welcome to my place,” Denny Alberts says ebulliently, arms spread to take in the lobby of HarborChase of the Park Cities, which gives the immediate feel of a chic boutique hotel. Denny Alberts decided there was a need for upscale senior housing and assisted living after his father-in-law, who was dying from Alzheimer’s, went to live in a memory care community but there were no accommoda- tions for his mother-in-law. She wound up living in a nearby condo. You might expect this from Alberts, who is well acquainted with luxury hospitality, having been a driving force behind the Ritz-Carlton Dallas as well as The Mansion on Turtle Creek and Crescent Hotel. But HarborChase isn’t Big D’s latest lure for elite travelers. The eight-story, red-brick, SMU-esque, terraced midrise going up along the Dallas North Tollway at Northwest Highway is Alberts’ company’s latest generation of luxury living for seniors who may need a little extra TLC. Next month, tenants will begin moving into 134 assisted-living and memory-care apartments that look a lot like trendy urban rentals in Uptown but are adapted for the needs of the slower set. The 68-year-old real estate executive has had a hand in developing billions of dollars in real estate, but the idea of changing the quality of life for those at the later end of the age spectrum is the dearest project to his heart. It’s the new-generation flagship of Silverstone Healthcare Co., which was founded in late 2013 by Alberts and Fort Worth billionaire John Goff, CEO of Crescent Real Estate Holdings, who owns the Ritz and Crescent hotels and is joining his longtime buddy in this labor of love. “I knew Denny was going to be successful with this company because he’s really good at identifying great parcels of land. Goff and Alberts, who’ve been buddies for 25 years, first became business partners in 1999, when Alberts sold his privately held real investment trust for $1.5 billion and Goff needed a strong No. 2 for his publicly traded REIT that owned the Crescent office complex. “I called Denny up. We met for lunch, and it was done,” says the 62-year-old Goff, snapping his fingers. “Took five minutes. In 2007, the duo sold the Crescent REIT to Morgan Stanley for $6.5 billion — just before the financial and real estate markets cratered. “Thank you, Morgan Stanley, thank you,” Alberts says, still giddy 11 years later. Goff gives Alberts a smug smile. After the sale, Goff formed his second Crescent iteration while Alberts went into semiretirement as he contemplated what to do next. His father-in-law, Louie Comparin, who was dying from Alzheimer’s, inadvertently gave him the answer. Alberts saw the loving care Comparin was given by the staff of Silverado Turtle Creek Memory Care Community on Dickerson Avenue. But there were no accommodations for his mother-in-law, so she lived in a nearby condo. There’s nothing sedate about HarborChase of the Park Cities, which is going up along the Dallas North Tollway at Northwest Highway and features billiards, game and wine rooms, a creative arts studio, a spa, a solon and a fitness center. “People want to be in an urban area where there are things to do and they can be near their children,” Albert says. He did nearly two years of research trying to figure out whether this was a good business model that also had soul. In a tale reminiscent of Forrest Gump, Alberts came out of church one Sunday after Comparin died and found a feather on his windshield. The first person Alberts called was Goff. 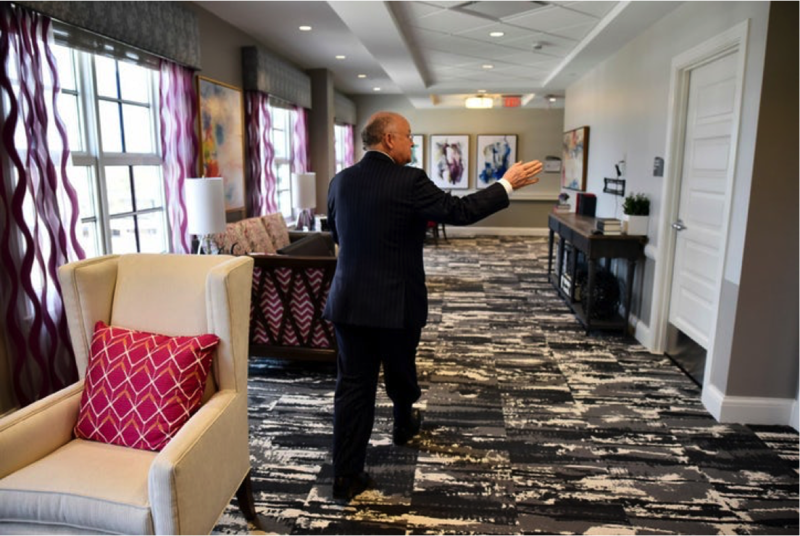 “I sat down with John and said, ‘Here’s the strategy: We want to do upscale senior housing, assisted living and memory care.’ It was another five-minute conversation. Goff had his own reasons for going forward. Years before, his father developed early onset Parkinson’s disease and had to be moved from his Hill Country ranch. Alberts, a partner with Dallas based Silverstone Healthcare Co., has had a hand in developing billions of dollars in real estate, but the idea of changing the quality of life for those at the later end of the age spectrum is the dearest project to his heart. “We really struggled finding a place for my mom and dad to be together,” says Goff. “Ultimately, I found a place in Fort Worth where they let me take one stand-alone unit and completely remodel it. It looked like one of these units by the time I was done. Alberts knows that food is crucial to the happiness equation. Ke’o Velasquez, a former executive sous chef at Four Seasons Resort and Club Dallas at Las Colinas, is planning the menus and directing hospitality, which includes private dining. “We have three wonderful private venues,” says Alberts. “That’s more private dining space than Dean Fearing has. Alberts recruited Fearing from the Mansion to the Ritz. “Denny has been a great friend to me since he and I planned the conception of Fearing’s in 2006,” says Dallas’ celebrity chef. “His support through the years has been tremendous. The average rent for an assisted-living apartment is $7,500 a month. A two-bedroom, two-bath penthouse goes for $12,000. The second floor consists of 29 apartments with controlled access that are dedicated to memory care. Basic memory care is $9,000 a month with additions for more extensive needs. Real estate executive Chuck Anderson is about to move in his 84-year-old mom, who has Alzheimer’s and is from a small town in Nebraska. I office a block and a half away,” says the partner of Bandera Ventures. “Convenience is one thing, but they’ve got a state-of-the-art facility with state-of-the-art treatment. “And they’ve been unbelievable in helping us get everything filled out and processed. Residents get $750 in monthly dining dollars included in their rent. Most have leftover dollars that they can use to pay for guest meals. The leases are for one year with a satisfaction guarantee. “If you don’t like living here, we’ll tear up the lease,” Alberts says. The building is supposed to have 134 units, but the number probably will shrink. Several potential residents want to put two or three units together and then do more expensive finish-outs.But aren’t these rentals? “If someone wants to put another, $2, $3, $400,000 into one of these, God bless ’em,”Alberts says.HarborChase Park Cities recently got its licenses and is 25 percent leased. Alberts says it will be 50 percent filled by its grand opening on April 18. There’s nothing sedate about HarborChase: no traditional British hunting scenes, stately grandfather clocks, Queen Anne wingback chairs. But there are billiards, game and wine rooms, a creative arts studio, a spa, a salon and a fitness center. Each floor is done in a different vibrant hue and theme designed to ignite the synapses, not lull them. There are 14 “memory-care light” apartments for people with less serious cognitive issues who aren’t flight risks. These apartments are situated around a large room set up for mental gymnastics. Alberts says during our tour. The more serious memorycare apartments on the second floor are remarkably similar to all the others with obvious exceptions like kitchens. The dining area resembles a hip, sunny bistro. Instead of menus, memory-care residents will be shown two different plates of food. “That way they feel good about themselves that they made a decision,” he says. 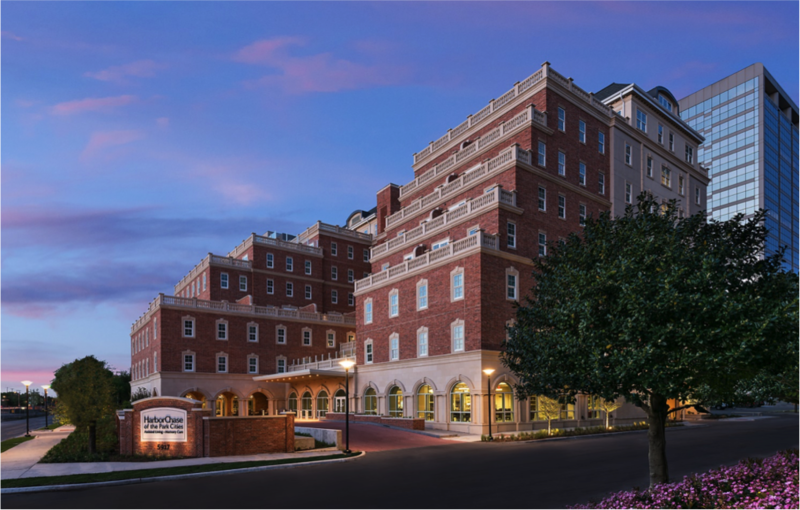 Alberts sees Tradition Senior Living, with locations in Prestonwood and on Lovers Lane, and Belmont Village Turtle Creek as Silverstone’s main rental competitors. The communities typically require a deposit of one month’s rent, he says. Some luxury communities, including the Edgemere on Northwest Highway, require a significant deposit with at least six figures. Alberts praises both Tradition and the Belmont as quality companies and contends that there is more than enough demand to support upper-end communities in happening locations. HarborChase, which is managed by Harbor Retirement Associates, has two sister communities in Plano and Southlake, but they are lowrise suburban communities. Alberts and Goff have brought in four equity partners. 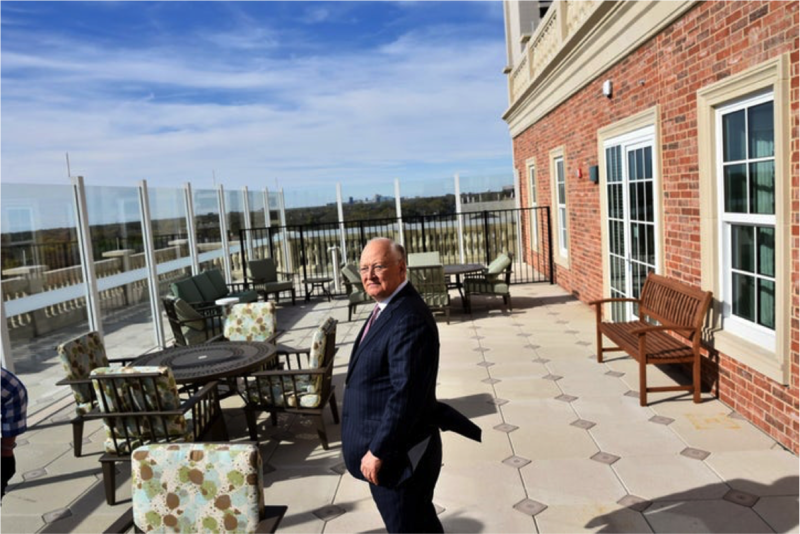 In addition to Silverstone’s three communities here, the Dallas company has three completed communities in Florida and Virginia, and four in various stages of development in the Washington, D.C., metro area. The 10 communities will be worth more than $1 billion once they’re all completed. “We’ve come a long way in five years,” says Alberts.